Its dangerous to go alone! Take this. This is one of the most memorable and oft-quoted lines from a 1986 action adventure game that would go on to be the first in a long series of popular video games. The game in question is none other than The Legend of Zelda. The first of its series, this game is quite influential and helped to spawn a genre and a series that gamers have followed and loved for years. The original game told the story of Link, an unlikely yet courageous hero chosen to rescue the princess Zelda, who has been imprisoned by the nefarious Ganon. This story is the backbone of most Zelda games, yet each one also features their own twists, turns, and unique touches, ensuring that no matter which Link you play as, which Ganon you defeat, or which Zelda you save, each game in the series is a memorable one. We celebrate this game with a wide array of cool products, ranging from collectibles like sword reproductions and shield plaques to everyday apparel that sport graphics and art from the best loved of the Zelda games, including titles like Ocarina of Time, Wind Waker, Twilight Princess, Skyward Sword, A Link to the Past, and more! We also offer a number of other smaller accents that are great for casual use. 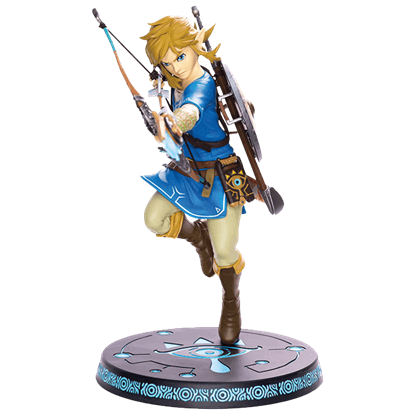 Celebrating your love of the Legend of Zelda has never been easier, so begin your journey here to make sure you have all a hero needs! Remembering the retro days of gaming can be a great time of nostalgia for fans of classic video games. 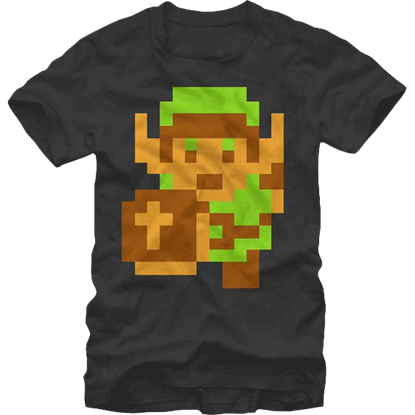 This 8-Bit Link T-Shirt is ideal for these fans, showing the Legend of Zelda hero in his original pixelated form from 1986. A popular icon in the Zelda game franchise, the Hylian Triforce represents the royal family of Hyrule. 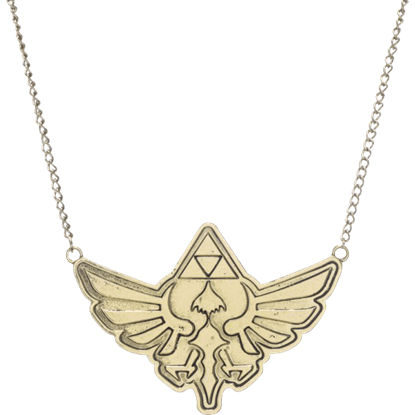 The Antique Brass Zelda Necklace transforms the fantasy symbol into a fantastic piece of Zelda jewelry for fans to wear. The Hylian Triforce symbol represents the royal family of Hyrule, appearing as a popular icon of the Zelda game franchise. 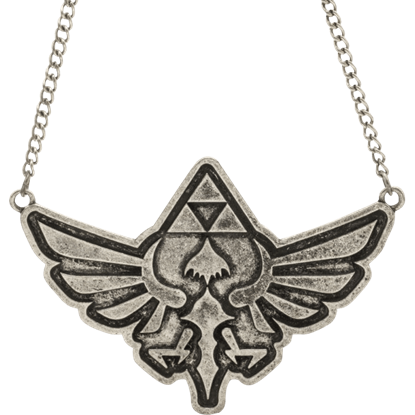 The Antique Nickel Zelda Necklace makes the classic symbol a fantastic gamer accessory for fans to wear. 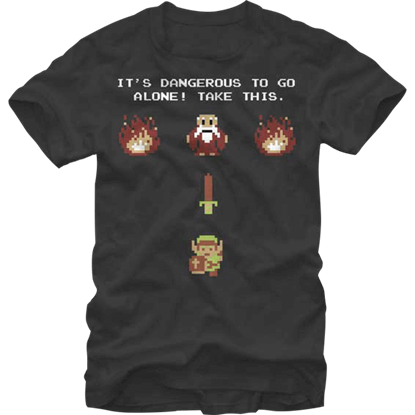 Based on the classic quote from the Legend of Zelda, the Dangerous to go Alone T-Shirt is as comfortable as it is nostalgic. To fans who played the 2D version of this game, this quote defines the rest of Links journey. 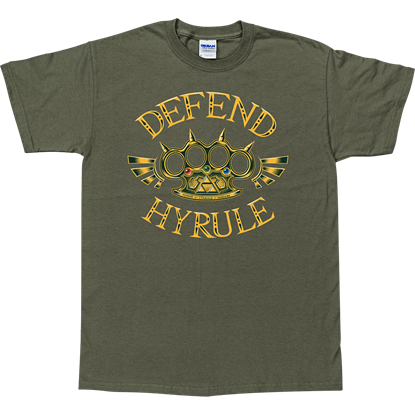 Inspired by the videogame franchise The Legend of Zelda, the Defend Hyrule T-Shirt features the image of the Triforce and the words DEFEND HYRULE. 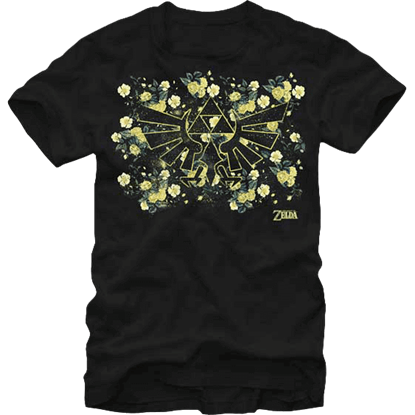 This shirt is wonderful for displaying your love of these classic adventure games. Hyrule, the kingdom where the highly popular the Legend of Zelda games take place, features a distinctive symbol that is known well by fans of the games. The Floral Wingcrest T-Shirt depicts that symbol in a bright and unique way. 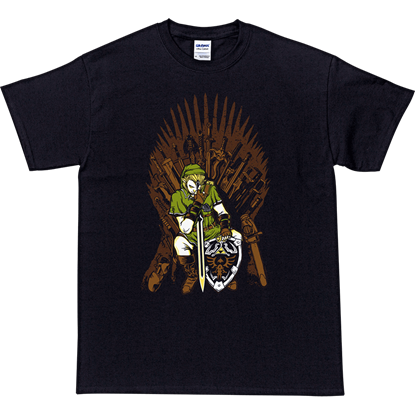 In a design that borrows from games and movies across the fantasy spectrum, the Game of Swords T-Shirt features Link sitting upon a unique representation of The Iron Throne from the fantasy series A Song of Ice and Fire. 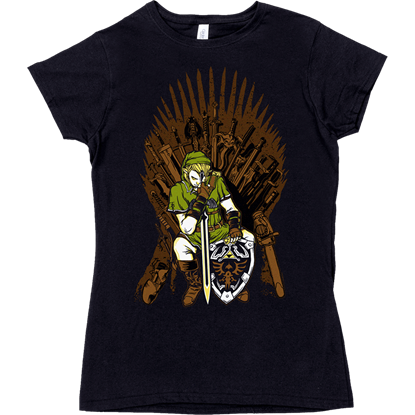 Spectacularly merging items and designs from across the fantasy spectrum, the Game of Swords Womens T-Shirt depicts Link from The Legend of Zelda sitting on throne which emulates The Iron Throne from the hit show Game of Thrones. Throughout the Legend of Zelda game series, Link has continuously saved Hyrule with the help of his sword, his shield, and the Triforce. 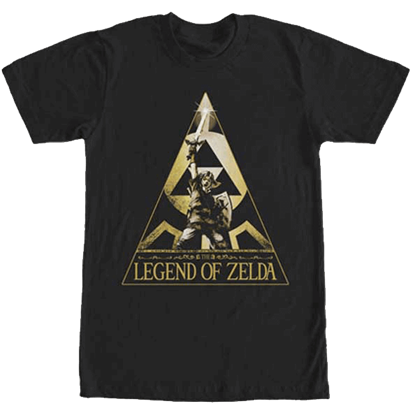 All of these relics are pictured with a heroic Link on this Golden Victor Legend of Zelda T-Shirt! As the sun sets on the Lost Woods of Hyrule, the Skull Kids frolic around as they cause mischief and play musical instruments all throughout the night. 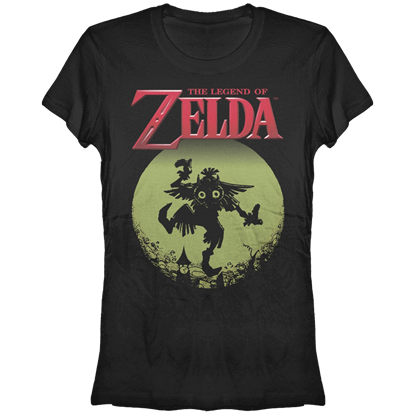 Show your love for gaming with this Juniors Legend of Zelda Majora Moon T-Shirt! 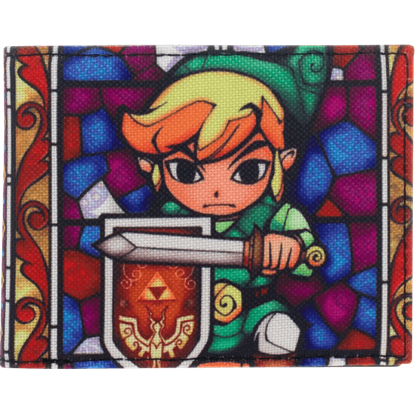 Featuring three different Link graphics in the iconic cel-shaded stained glass design of The Wind Waker, the Legend of Zelda Link Bi-Fold Wallet makes a colorful Legend of Zelda collectible for fans of the games to enjoy.